Whenever the Romneys get off script, they forget to pretend that they haven’t always been rich. A decidedly off-message statement from Ann Romney on Sunday’s Meet the Press was overlooked by the media, since everyone focused on Mitt Romney’s false claim that he would make sure people with prior conditions can purchase health insurance. Ann Romney made a noteworthy admission in the same interview, and the Progressive Change Committee is launching a targeted online ad campaign in Ohio to make sure voters there see it. Ann said, “Mitt and I do recognize that we have not had a financial struggle in our lives.” This is a classic “Kinsley gaffe,” defined as a when a politician accidentally tells the truth. 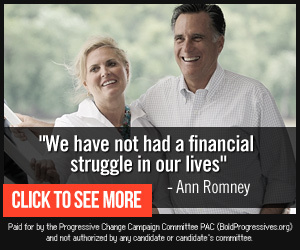 Of course, the Romneys—who grew up wealthy and became far wealthier—have not had a financial struggle. They were not easy years. You have to understand, I was raised in a lovely neighborhood, as was Mitt, and at BYU, we moved into a $62-a-month basement apartment with a cement floor and lived there two years as students with no income. The stock came from Mitt’s father. When he took over American Motors, the stock was worth nothing. But he invested Mitt’s birthday money year to year—it wasn’t much, a few thousand, but he put it into American Motors because he believed in himself. Five years later, stock that had been $6 a share was $96 and Mitt cashed it so we could live and pay for education. The Romneys tried very hard in the Republican National Convention to create a false image of themselves as regular Americans who understand the tribulations of struggling families. Since Mitt’s proposes to raise taxes on the middle class to pay for tax cuts for the wealthy, this is a very important con game for him and his wife to play. But as soon as they go off script, the truth comes out.